This was suppose to have posted yesterday, but for some reason Blogger wasn't liking me and kept giving me an error. Happy Good Friday. Today's Friday Favorites I have decided to do as my Easter Decorations Edition. I can't believe it is already here, well on Sunday. We have a fun filled weekend with going to my parents on Saturday, and my in-laws on Sunday. It finally started to feel like spring with warmer weather is hopefully here to stay. Saturday is supposed to be a high of 81. I am so excited. Be sure to check out Narci, Erika, and Andrea for more Friday Favorites. 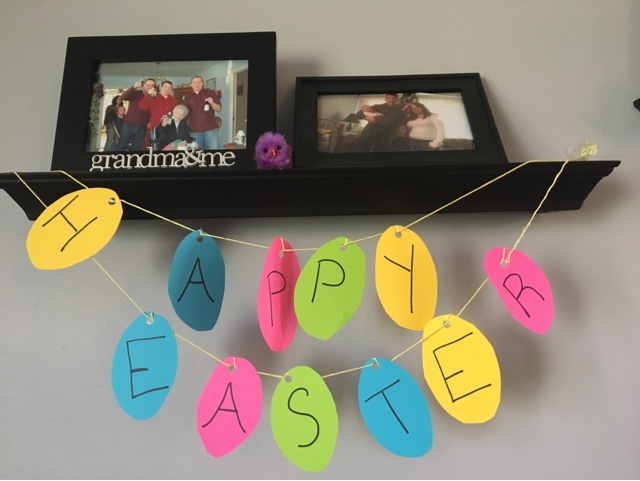 This year as a fun little Easter craft, Ella and I cur out colored paper eggs, wrote HAPPY EASTER on them, then strung them together and then up in the living room. You could say I have a frog Easter basket problem. I have an Easter basket program in general. There are probably 8 more baskets in the attic still. 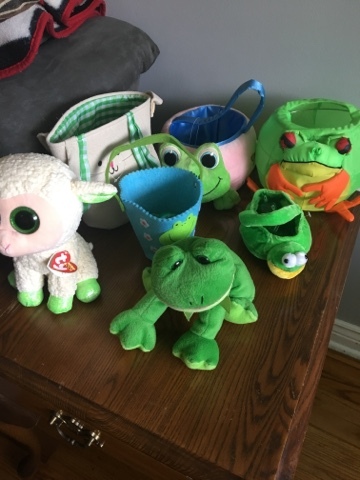 I have gotten in the habit the last 2 years buying useful "baskets" instead of reusing other baskets. Last year we did an upside down umbrella as a basket, and this year we are using a bucket. I found these cute little chicks are World Market. They are so adorable and bendy. It came with 12 of them in 3 colors. 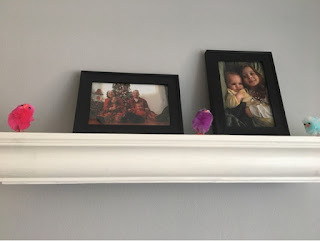 I have them spread out over the shelves in the living room, minus the 3 Ella stole for her room. I have no idea where I got the cute little Happy Easter sign. 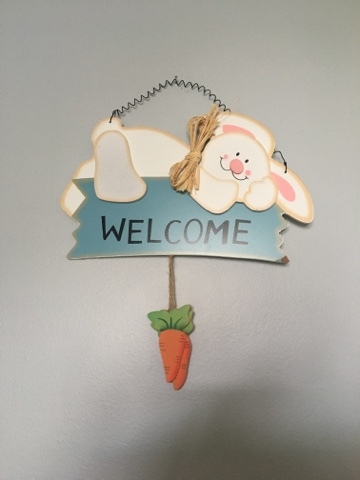 The painted bunny I found at the Dollar Tree. Ella painted it all by herself one day while I was hugging with Austin. I love this cut little simple Welcome bunny sign. I have had for a few years. 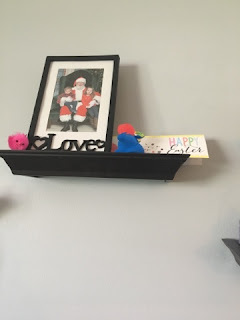 I think it was a Dollar Tree find. Any holiday I get to hang streamers in a win for me. 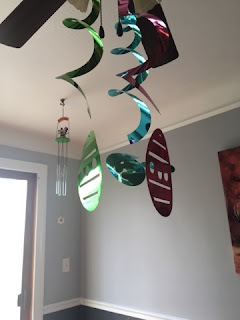 I have had these for a few years and keep reusing them, hanging them from our fan in the dining room. 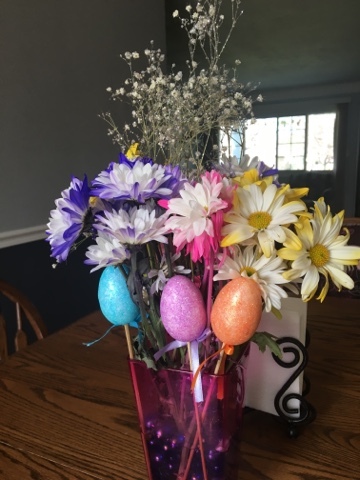 I love the smell and look of fresh flowers on the dining room table. These ones I got from Walmart 2 weeks ago. They have lasted the longest. The glitter baby's breath I got from a bunch over a month ago. 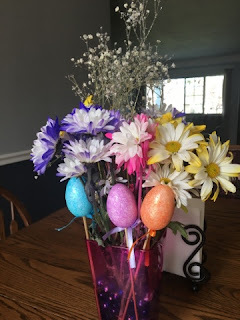 I added in cut little foam eggs that were also a Dollar Tree find. Usually I can never go wrong with what I find at our local Dollar Tree where everything is $1. The only thing I have found those is you have to buy it when you see it, not wait a few days or come back closer to the holiday cause they won't have it. I remember seeing Valentines Day decorations up before Christmas was over.